Growing up with a November 4th birthday meant many Halloween/Birthday parties. It's weird, I know. I mean, there are all of four days between October 31 and November 4. That's like almost 100 hours. I guess maybe it made sense to my parents if Halloween fell on a Friday or Saturday, to combine two of my favorite holidays. I certainly don't recall complaining back then. My mom would decorate the living room with orange and black streamers and hang matching balloons in each corner of the ceiling. She'd set up Jack-O-Lanterns outside or in the front window and hang one of those flat scarecrow cutouts on the door - the kind that had movable arms and legs because of how it was fastened together. I'd spend a month preparing the perfect costume. 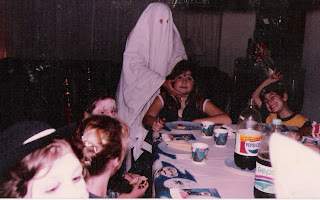 Looking through photos, I found three Halloween birthday parties as examples. One, I appear to be in third grade, the other fourth or fifth and another I'm in seventh or eighth. It's hard to tell really. Of course, I think I look pretty darn cute. Who didn't back then? There are cute photos of me surrounded by smiling little girlfriends all crouched around a homemade Duncan Hines® chocolate cake. It's hard to imagine that back then, there wasn't a Costco a few towns away who would take your order and create dee-lish baked goods at an affordable price. Nope, in the '80s, it was all about the boxed cake mixes and sugary canned icing - well unless your mom was Mrs. Cleaver or something. I remember instead of the usual party bag favors, Mom would stuff those little white Halloween themed goody bags with chocolates, a spider ring, a small super bouncy ball and top it off with a tiny pumpkin eraser. She'd often make a few extras "just in case" a kid showed up who neglected to RSVP. Of course I'd keep the extra booty all for myself. Yup, I'd just combine them with my leftover Halloween stash. When planning our wedding, I knew I wanted a fall wedding. I had wanted a fall wedding back in college when I was dating a guy who had no intention of ever marrying me, but whatever. I remember wanting the Friday after Thanksgiving even back then (always combining my fall events). When I mentioned this to my family and then fiance - they were against combining the holiday weekend with a wedding. They insisted people would be away visiting their families, etc. When we sat down with our banquet coordinator, sixteen months before our actual wedding date, we were shocked to hear October was booked solid. Apparently the fall is the new summer for weddings. Then again, maybe it was just this particular hall or maybe there are way more fall weddings on Long Island than in New Jersey since everyone else I know who married in New Jersey had no problem securing their November date of choice. So going through her datebook, our banquet lady pointed out that she only had one available weekend (other than the Thanksgiving Friday) and it happened to be my "birthday weekend" - November 8th. I thought about it for a few minutes. It's kind of nice to get married near your birthday. A funny thought popped into my mind... if I was sitting at a guest table, I'd "win" the centerpiece - if they did that "the person with the closest birthday wins the centerpiece" thing. Just kidding! So I agreed and she joked that my birthday would officially blend in with my anniversary the way December kids get gypped at Christmas. I knew she was right and that day, I mourned the loss of my November 4th birthday. This year is our one year anniversary and I am to blame for planning a trip to Florida that has us flying out two days after my birthday and unfortunately my husband has a work event the night after my birthday, which happens to fall on a crappy Wednesday this year anyway. Halloween weekend is booked with a party, so I snatched up the day before Halloween. We're going to Atlantic City basically because DH asked me which steakhouse I wanted as the backdrop for my romantic birthday dinner. When I named our local favorite, he actually said, "Come on, how about something different or better?" My ultimate favorite steakhouse is in Atlantic City. He agreed and we're set to go! I can't wait for him to experience it. I went with my mom over the summer and it was so yummy. Expensive, but yummy! So, no, I can't complain about my birthday getting lost in the shuffle, but I can agree with our wedding banquet chick. 2008 was probably the last real birthday, which was ironically kind of lost due to last minute wedding arrangements. I mean think about it, who is relaxed and has time to plan a party four days before their wedding? Last year, my mom even warned me... "Don't expect any fanfare this year with your wedding four days away!" I believe she followed that warning similar to banquet lady's meaning, kiss that November 4th date goodbye forever, you only get one day to celebrate and I'm quite alright with that. I just wanted to share my story with you guys. 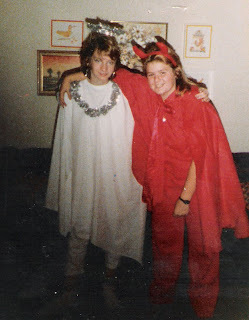 My former BFF Serena and I as we prepared to party at my parent's house before the birthday/Halloween guests arrived in 1985 or 1986. My 10 Most Favorite Childhood Gifts Ever! Whatever Happened To DIY Halloween Costumes?